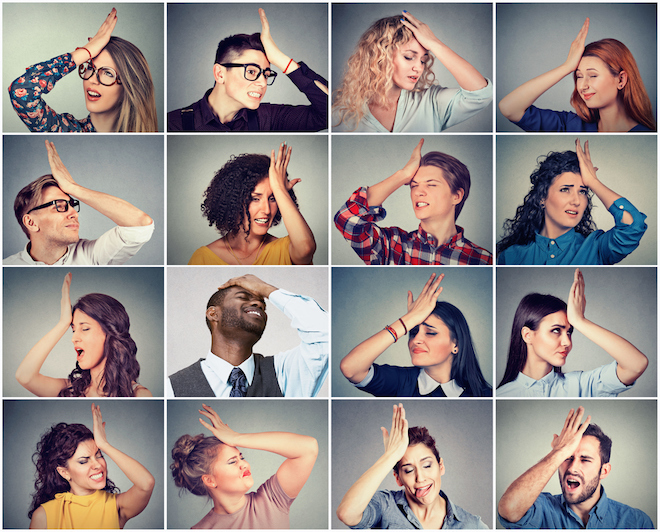 We look at the rise of Bitcoin Regret Syndrome. It might not be in the Oxford Dictionary (yet), but it’s alive and growing. Hide your kids, folks! The internet gave us FOMO. FOMO, which stands for Fear of Missing Out, might have been around since Caveman B was bummed that he had missed the sleeping mammoth that Caveman A stealthily took as a hunting trophy because, urgh, nature called. But it’s only since the rise of the internet and having knowledge of all sorts of mindblowing happenings at our fingertips that FOMO has become an emotion as legit as anger or joy. Cryptocurrency is fast teaching investors a lesson: don’t put off until tomorrow that which you can buy into today. Bitcoin is headed for Jupiter, after all. One month ago, we reported on a momentous landmark: Bitcoin had hit the US$10,000 mark. Today, at the time of press, it sits at just over US$14,000. It’s almost making us blase, these days. “Let’s talk again in a few days when it moons past US$20,000,” we say to young (or not so young) padawan naysayers. 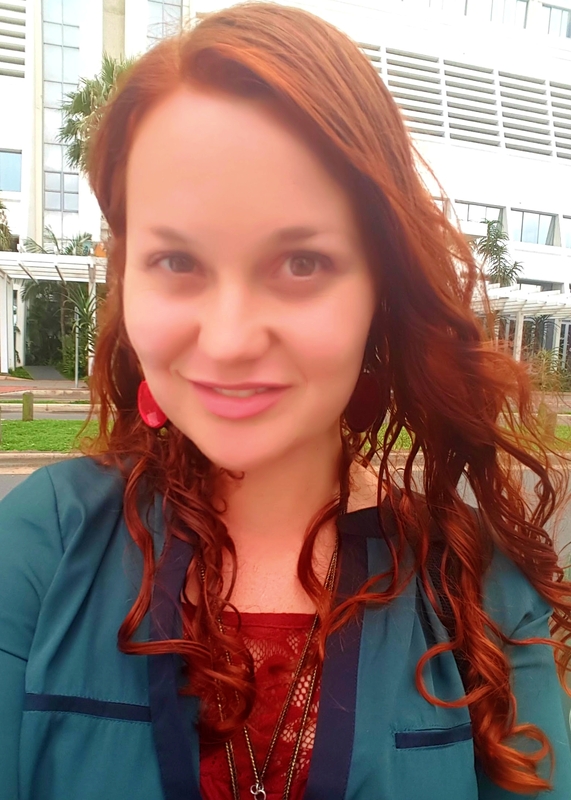 Facebook feeds and Reddit posts aren’t the only places you’ll see people lament their bad luck for having lived for so long as though cryptocurrency – and most notably Bitcoin – didn’t exist. It’s become almost as common to see dedicated websites reminding you of your historical failures. The “bitcoin pizza” has become a pricing index benchmark. In 2010, one random guy posted a challenge on a forum, offering 10,000 bitcoins in exchange for a pizza, and another random guy halfway across the world did just that. The birthplace of Bitcoin Regret Syndrome: US$41 for 10,000 bitcoin! While the exercise was an attempt to illustrate that bitcoin could be used for transactions in daily life, it’s since become a handy reference point for bitcoin’s surge. 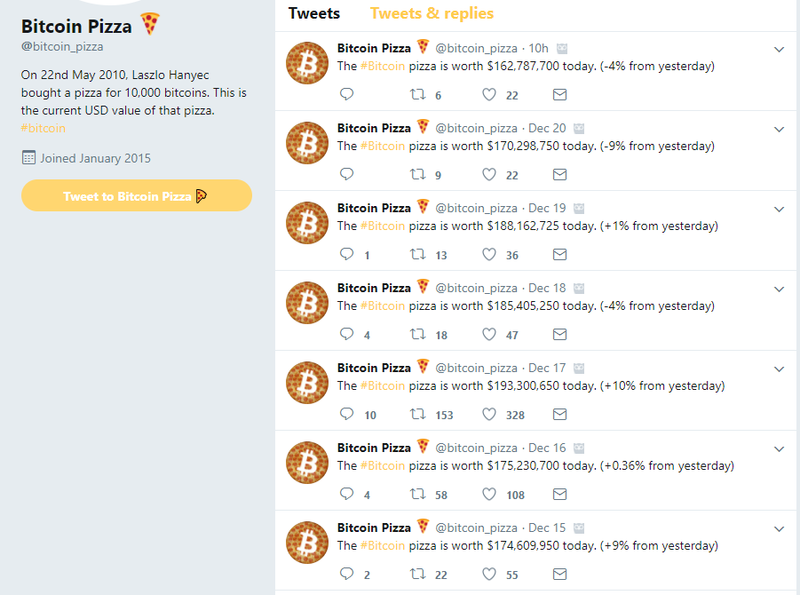 The bitcoin pizza Twitter feed is ever-ready to remind its audience of how much crypto dough he’d be rolling in right now (if it wasn’t for the pizza pastry dough he swallowed down all the way to his hips). 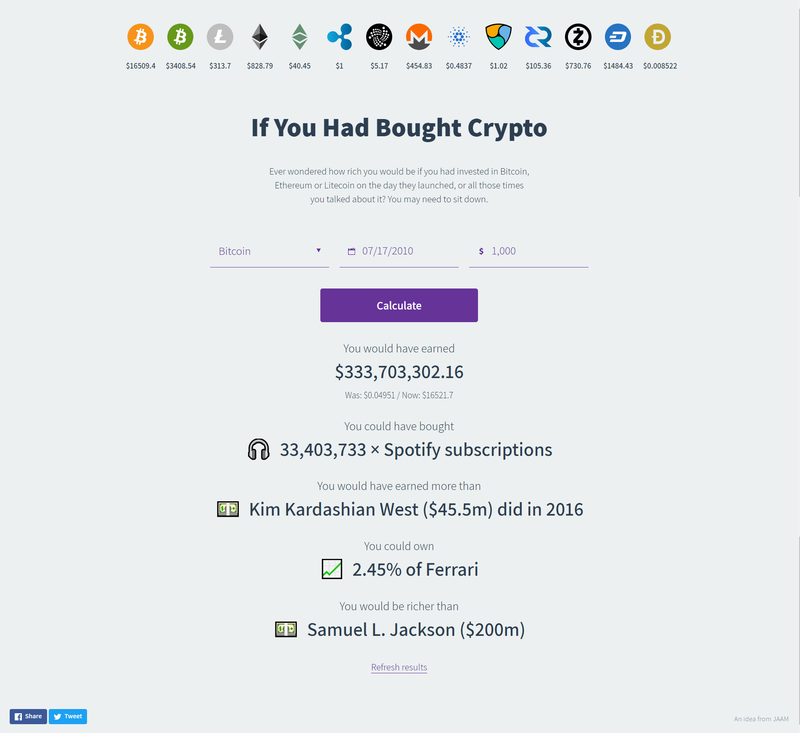 A new website, If You Had Bought Crypto, is taking this is a step further. A simple UI belies the great pearls of insight the site serves to satisfy your BRS (Bitcoin Regret Syndrome). Enter any date, and pick your poison. Was it Bitcoin, Bitcoin Cash, Litecoin, Ethereum, Ethereum Classic, Ripple, IOTA, Monero, Cardano, NEM, Decred, ZCash, Dash, or Dogecoin you had so spectacularly failed to throw your money at? Input a fiscal value, and watch it work its magic to bring tears to your eyes: would you look at what you’ve missed out on! The real question is: Which lucky fish would you have given those Spotify subscriptions to? The fact is no one knows where cryptocurrency, in general, and bitcoin, specifically, is going. Is it a bird, is it a plane, is it “tulip mania”? Or is this the birth of a new global economy that transcends borders, banks and government regulations? No one knows, but those who want to gamble a stake on the pile are getting their wallets out. Unless you’re a day trader incessantly checking the pulse of your favourite coins as their heartbeats rise and fall, you’d best buy in at any given time. So what if you didn’t buy at a time when a US$100 investment would’ve meant owning seven rare breed rainbow unicorns today? If you want in, get in. Don’t beat yourself up on doorways missed and windows long since shut.